The amendments to the IDP is based on the changes of the Municipality’s macro restructuring and the alignment of the Performance Management as well as the Service Delivery and Budget Implementation Plan (SDBIP) as projected in the IDP. 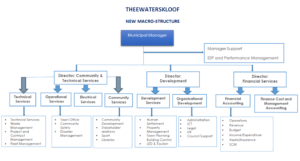 The changes in the macro structure from five (5) directorates to three (3) as well as the establishment of a new department namely Community Development necessitates a realignment of the Strategic Goals and Strategic/IDP objectives to these directorates. These changes are considered major and therefore necessitates an amendment to the IDP as well as SDBIP.